TGIF right? I think I speak for most of us when I say that phrase, since this week has been such a long and slow one for me, with a struggle to get up and function every day. This is partly due to the fact that a huge snowstorm hit the VA/DC area which left several people with power outages, not being able to leave their houses, and my school closing down (a good thing to most), leaving me behind in classes which means I have more studying – eek! 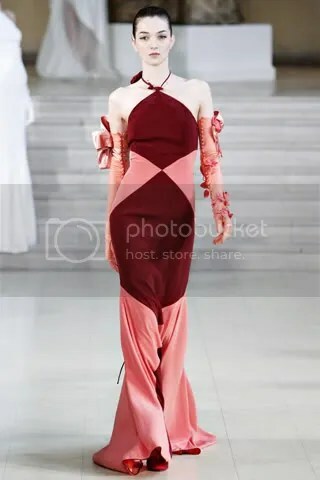 I’ve just finished taking a look at and dropping my jaw at this year’s Spring 2011 Couture collections, and may I say that I could not get enough of them! 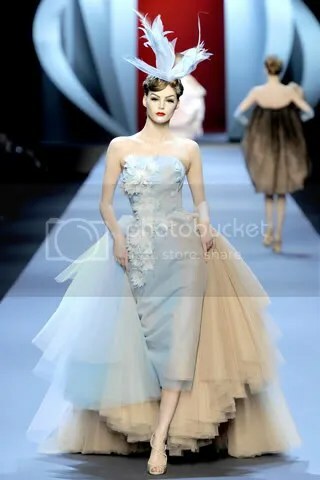 For today’s edition of Friday Favorites, I’ll be sharing my favorite Couture collections. Paris’ semi-annual Couture Week is a breathtaking gala of the very finest in luxury fashion design, a chance for designers to indulge their most idealistic fancies–no matter how expensive or un-sellable–and for audiences from around the world to delight in the glamorous parade of their uninhibited imaginations. Let’s take a look! 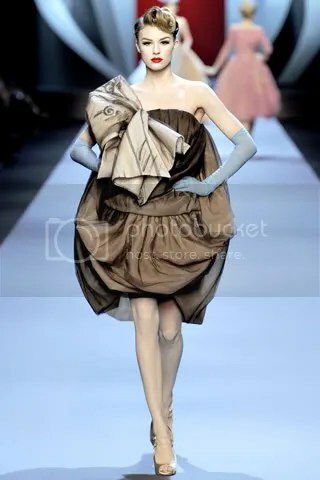 The theme of Alexis Mabille’s Spring 2011 Couture show was of mirrored images. Each outfit was presented in white and then reconstructed in a colored version. For example, the first piece, “Vestale”, was a floor-length gown in the purest white color; it was then followed by the exact same piece in a beautiful midnight blue. Mabille cut one dress from squares of white lace, then duplicated it in the same lace hand-painted in the colors of pretty porcelain. The effect had an impact of dark versus light —when an asymmetric, one-shouldered gown in two tones of green with a pink rose garland reappeared in white. The fragile details of the designer’s worked truly shined in the various elements constructed in each composition. Giorgio Armani has reached a stage in his life where he cares most about pleasing himself – which isn’t necessarily a negative thing, considering this remarkable show. With this, he delivered a collection that will startle longtime admirers and add more guests to that long-overdue reevaluation. Loving anything and everything space-like and futuristic, this show left me wanting every piece that was displayed on the runway. Inspired, he said, by the shine of gemstones, Armani produced clothes that came from another planet (I mean seriously, look how out-of-space these look! 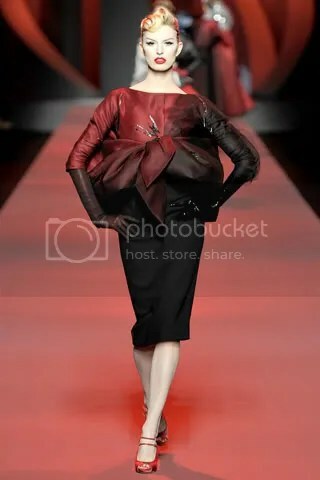 ), the same one that Pierre Cardin and Thierry Mugler might have touched down on once. The first outfit—jacket, skirt, and leggings—shimmered around the model’s body like liquid mercury. Her metallic saucer of a hat—one of many made by amazing hat designer Philip Treacy for the collection—beamed in signals from above. The ensemble set the tone for the sci-fi extravaganza that followed. “Tron-y, a bit,” said Olivia Wilde, who sat front row, and should know. The show never stopped gleaming. By some venture of fabric technology, a mirror effect managed to give organza a reflective quality. Silk was threaded with metal to produce a beautiful sheen. Broad collars and bodices that looked molded from some hard alien material were actually willowy and light. The sci-fi aspect was reinforced by silhouettes curved and carved to rearticulate the body in incredible shapes. One striking example sliced the dress off at the hips, dropped a few inches, then picked up again in a fall to the floor. But inside those missing few inches was a bright, billowing slash of scarlet. 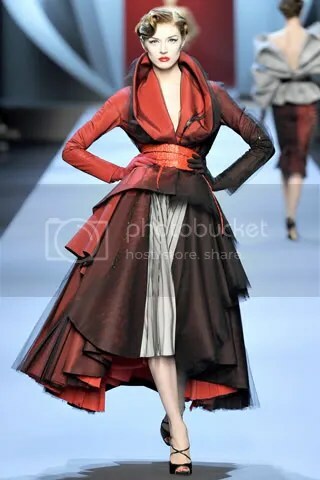 Armani definitely had the courage of his confidence with this technique, putting a little distance between the skirt and the body over and again. The models looked like they were shedding their dresses, like second skins. Each outfit looked as if it was about to melt right off the model’s body. Breastplates of large colored gems were a striking option for evening. An alternative to the UFO headgear was a fencing mask studded with crystals. Although some would not see themselves wearing pieces in this collection, it is a definite fact that Armani knows how to create silhouettes to accentuate the women figure and produce beyond quality pieces that leave us in awe. Karl Lagerfeld created the Chanel collection that was beautifully luminous in its delicacy and sparkle. Dresses that looked spun from cobwebs weren’t even fabric, rather, they were pieces of embroidery. Ten million beads were used in all and the result was literally a cloth of light. But light is not only illumination; it’s also a lack of weight. There was a precise, light grace to the shifts, the tops, the fitted jackets, and floating chiffons, all of them built on sequined leggings. And every model walked in a ballet flat, which was bound to the ankle by transparent straps, and it completely changed the attitude of the show. All those teenage models who look like ball-breaking vixens in their face paint and vertiginous heels when they walk for other designers were suddenly turned back into pretty, pure-looking girls in flat soles and clothes the color of a dawn sky. Artist Marie Laurencin was his inspiration. In 1923, she designed Les Biches, a ballet commissioned by Diaghilev with a scenario by Cocteau. Chanel was designing Le Train Bleu for the ballet impresario at the same time. She asked Laurencin to paint her. The stillness and sweetness of the portrait that came from the sitting weren’t appealing to Chanel, but Lagerfeld took advantage of those qualities to reinterpret her spirit in a way that was alluring and modest. 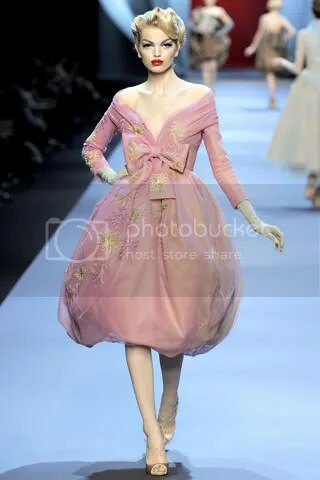 The pink bouclé suit, the drop-waist dress, the sugary, rough-edged tweeds were fragile where Chanel herself was steely. Lagerfeld himself acknowledged the contrast when he paraded model Stella Tennant like the Black Queen in a gown of sequined chevrons, but then we notice his heart clearly lay with the White Queen Freja, whose coat-dress looked like it had been stitched from ice crystals. He has truly made Chanel’s world his own. 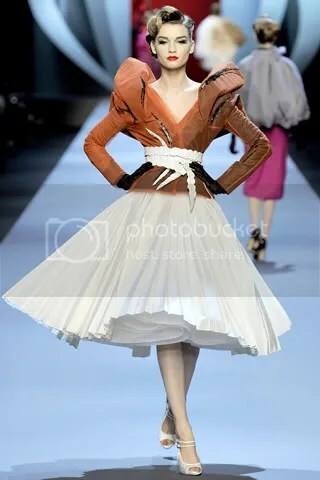 Oh, Galliano, you never cease to amaze me, from your designs to your attitude when you strut yourself down the runway after the models. One of the main things I love about watching new collections (and just fashion in general) is how they teach me something new. 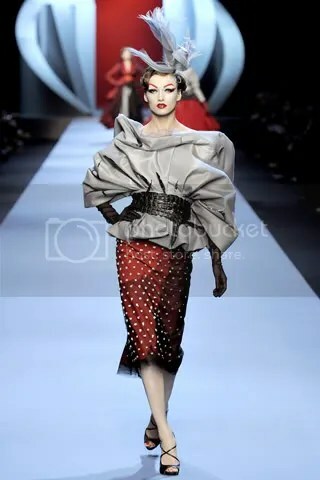 Whenever Galliano puts on a show, I’m amazed as to how he came up with the backdrop and incorporated it into his designs. Originally, he studied to be a fashion illustrator at Central Saint Martins. Later on, his fate turned to design – thank God! 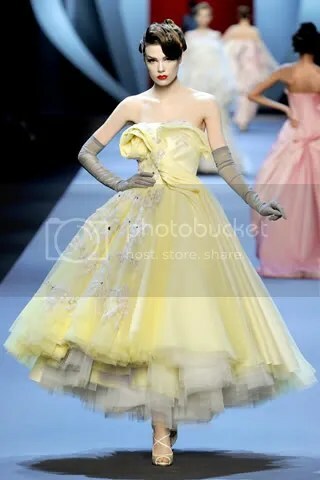 Galliano’s tribute to René Gruau, the illustrator whose work for Christian Dior in the 40s and 50s created the most iconic imagery, felt like it had been a long time coming, mainly because it gave him a great opportunity to pamper his own passion for an era when couture was truly haute. 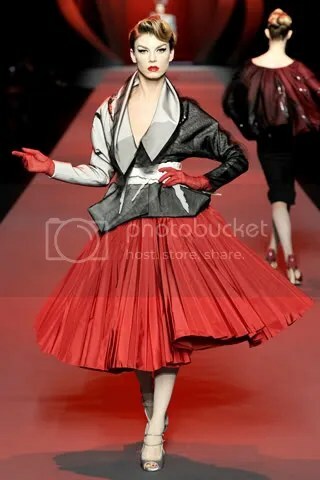 Even at that time would it have been difficult to match the remarkable performances of Galliano. The graphite smears, pencil strokes and scrawls, erasure marks, and gouache washes of Gruau’s illustrations were duplicated in cloth and embroidery in a beautifully artistic way. He called it his most technically challenging collection, and it shows. Dior’s new look was an obvious source point for skirts that flared from corseted waists or dropped pencil-thin to below the knee from rounded hips. The most dramatic effects were the interplay of light and shade, duplicating the wash of Gruau’s watercolors and the shadows of Irving Penn’s classic couture photography. We can assume that hand-painting fabric would have been the simplest way to achieve this result, but Galliano and his studio used seven layers of tulle to create a shimmering depth of dégradé. The effect was as quietly impressive as the wash of dark pink down a pale pink gown. Embroidery was used on one side of the fabric only, so it cast a subtle relief shadow. 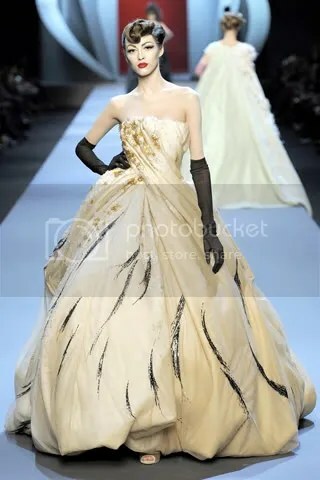 Ostrich feathers made splashes of ink on a huge ball gown, pencil lines were picked out in sequins. One left the show with the feeling that everyone involved had an absolute ball, creating the haute-est fashion for the sheer, pleasurable hell of it. Today, the question of how any of it would convert to anything approaching the real world could be handily put off until Galliano’s ready-to-wear show in March – can’t wait!